Description: Complete your holiday mailing with this Tiny Boughs of Holly printed return address "Sticky." 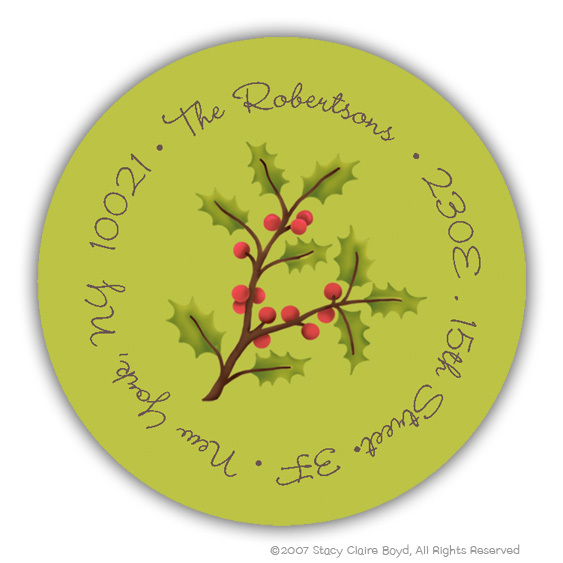 This design is solid olive green with a holly branch and red berries with your address printed around the outer edge. Stickers measure 1 1/2". Although they are fun by themselves, they do match Stacy Claire Boyd holiday cards (see Stacy Claire Boyd photo cards). Perfect to dress up or have fun with your envelope. Specify personalization.